We live on a few acres in Northwest Pennsylvania with our children, a couple of dogs, many cats, a small, spinner's flock of Finn sheep, a few Nigerian Dwarf goats, and a wide variety chickens. We have been selling braintan as our main occupation since 2002. Prior to that it was my hobby/obsession while I held a factory job. Looking back, we would probably have never taken the leap into full time brain tanning if my real job hadnt gone to Mexico. But, God has blessed us with great customers who keep coming back allowing us to live this new, simpler lifestyle. Liza home schools the kids and I do my best to keep the hides going out the door. 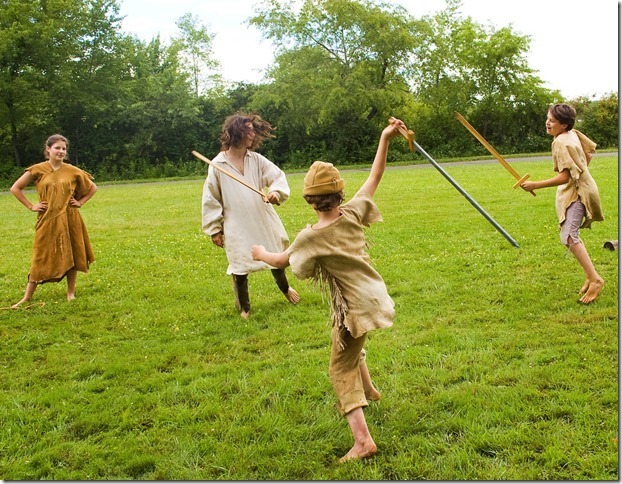 Besides brain tanning, we are always trying to increase our various primitive skills. 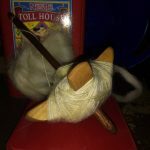 Although we have not by any means mastered them, our varied interests include finger, loom, and twined weaving, moose hair embroidery, knitting, hunting, trapping, fishing, archery, primitive fire starting, bobbin lace, beading and tin smithing, to name a few. It was a Thursday much like any other Thursday at the communal boatbuilding apprenticeship where I am studying in Maine. Dan, another apprentice, was on kitchen duty. Before breakfast is served we always have a “grace” of some nature–it takes different forms with different apprentices. Dan’s graces are often natural wonders. So it came to be that prior to breakfast that morning Dan pulled a dead mink out of a cardboard box and taught us some facts about mustalids. The mink had been harvested a few seasons back and frozen with the intention to tan later. Life got in the way. It hadn’t happened. 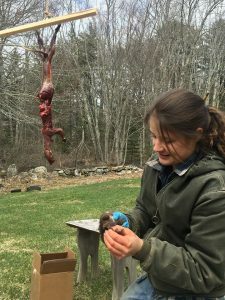 The other apprentices knew that I’d grown up hunting and trapping, and several were very interested to see the skinning process, so I agreed to do a teach and talk after lunch. 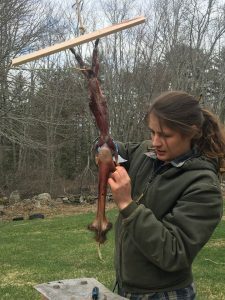 Not having a gambrel (the device used to hang an animal by its hind legs when case skinning) with me, I set to work rigging one up after breakfast. A cedar scrap, a bit of rope, an eye hook, and two regular hooks later, everything was set. I hung my makeshift apparatus from the clothesline post and set off to chapel, which is a weekly occurrence every Thursday. This particular week we learned to play the most basic form of Kung Fu. After chapel housecleaning was next, and then a smorgasbord lunch, another Thursday tradition. Now it was time. 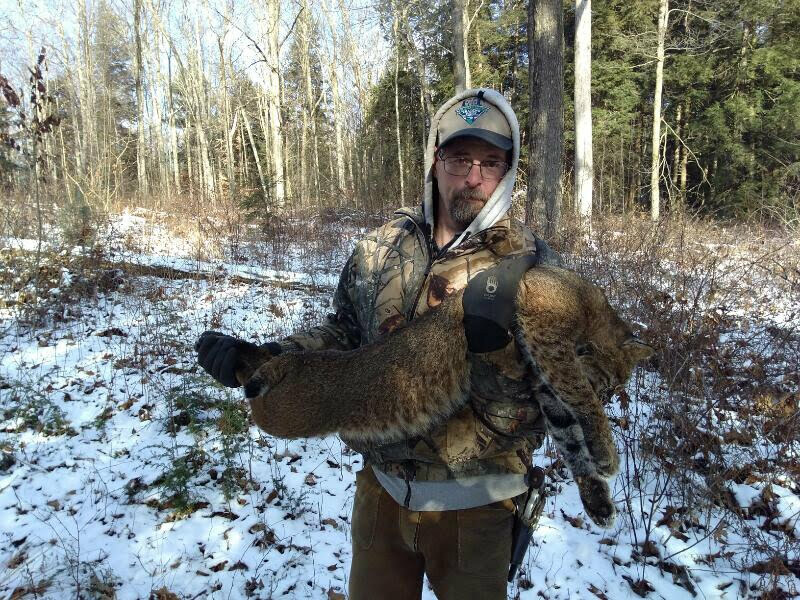 It should be noted that while I grew up harvesting and skinning animals, I hadn’t skinned anything in over a year, and not a large quantity of things in quite some time, so I was a bit nervous, hoping I’d remember it all. Turns out skinning is muscle memory–just like riding a bike. To start you dis attach the skin around both of the rear paws and make a V shaped cut from each paw to the crotch area. 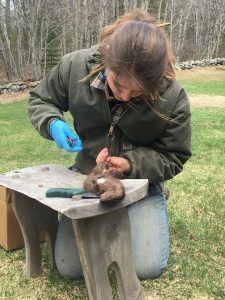 This is a particularly tricky operation on a mink because they have glands, much like a skunk, in that area, and if you cut one open you’ll smell like mink all week. 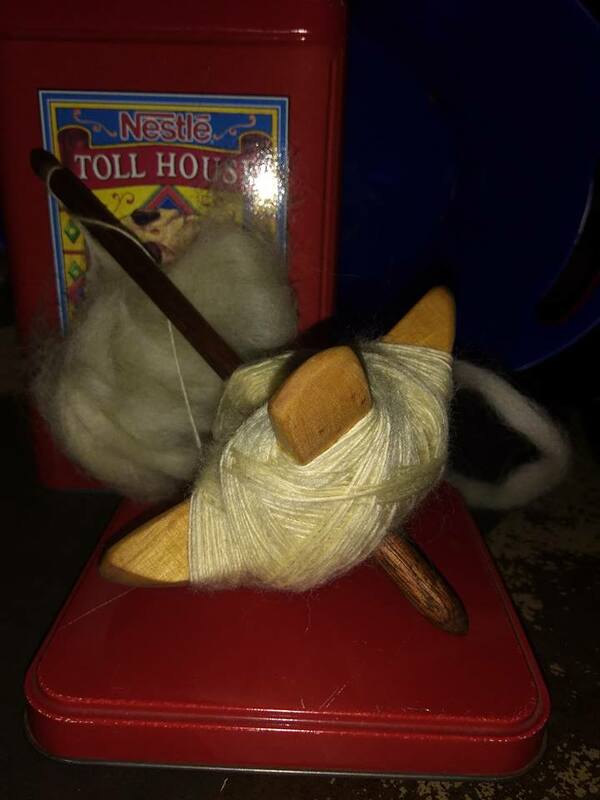 I managed not to hit the glands, although I still smelled minky all day, and made the small incision just past the base of the tail that turns the V shaped cut into a stubby Y. 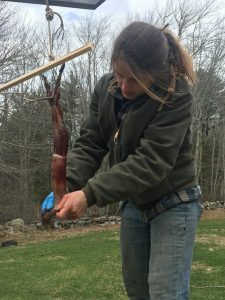 The goal of skinning, as my Dad taught it to me, and as I taught my attentive peers, is to use your knife as little as possible. So, after using my knife a bit to get it started, I pulled the skin back from the legs. Now, I was ready to use my jimmy rigged gambrel. By feel, I located the tendon on each hind leg and pierced the hook between the tendon and the leg bone. Next, I urged everyone to lean in for a whiff. In peeling back the skin the musk making glands, while not cut, had become exposed. Personally, I like the smell. Muskrat and mink glands are used in lures, and thus this smell was the backdrop of my childhood, whether making sets with my dad, skinning, or attending a trapping convention with the family. Now came a tricky part in the skinning process–stripping the tail. I didn’t have a tool to do this with me, so I took two sticks, placed one on either side of the tail bone and pulled. Using this method, I got the tail mostly extricated, but it was very dry from having been thawed and refrozen several times, so in the end I nipped a bit of the bone and left it in the pelt rather than accidentally rip this piece of skin from the rest. 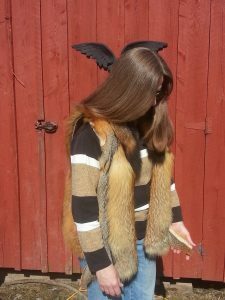 The tail wasn’t crucial to my intended use for the skin, this was only a demonstration, and time was limited. Pulling the torso portion is fairly straightforward. You just grasp the bits of skin that are already free and pull. But, it turned out to be a real crowd pleaser. This is the step where the pelt and the carcass really begin to look like separate entities. The front legs emerged, and I pulled out each one to the point where it came to meet the front paw. At this point, I made a cut around each leg, explaining that with this cut I faced the blade down, because I was intending to cut the skin, but with separating cuts that just remove skin from carcass, the blade is angled up so as to cut the interfering meat and fat but not to score or cut a hole in the skin. Even I was impressed at how it was all coming back to me. Although I shouldn’t have been–I had had the best of teachers. Next came skinning out the head. Peeling and pulling I arrived at the ears, each separated from the skull with one upward slice. The bit between the ears and eyes took tough pulling and upward knife strokes. At some point the innards spilled out some, which was not a great surprise as at some point the mink had been mishandled and a bit of the rib cage was already protruding the meat from the start, but again, this was an occurrence of much fascination to this crowd who hadn’t grown up doing do it yourself dissections or watching cats tear into muskrat carcasses as I had. The eyes came out cleanly, which I was quite proud of. 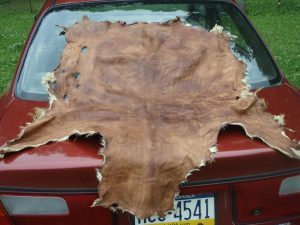 That’s something a fur buyer looks at to judge quality , and I’d lost dollars as a kid due to sloppily cut eyes and ears. Finally, I came to the jaw, and with a final cut the nose was free. 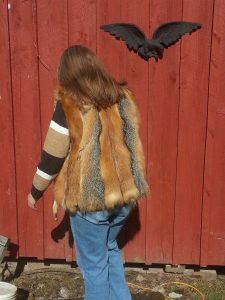 As I turned the pelt hair side out I noticed that the hair was slipping, as is typical of both “green” fur (animals harvested before their prime winter coats grow in) and, as in this case, fur that has been stored unprocessed overlong. All were appreciative of the demonstration and helped to clean up before we headed off to build boats for the afternoon. Some had attempted skinning before without any old timer’s know how instruction, and expressed how much simpler this case skinning method seemed to be. Since coming here I’ve realized on several occasions how fortunate I am to have had parents who taught me these and other skills such as weaving, tree tapping, and tanning. As many in the world are beginning to realize the value of living simply and close to the land, I’m so grateful for my parents who espoused those values before they became trendy. Don’t get me wrong, I’ve still got lots to learn and improve on, but unlike so many others, I know my kinfolk wholeheartedly support me each step of the way. So, as Mother’s and Father’s day are coming up, I’d like to thank my parents. All the things you taught me that made me a weird teenager are making me an interesting adult. We are proud to announce that our daughter is now hand crafting and selling both Turkish drop spindles and wooden spoons. I have personally spent some time spinning on one of her drop spindles. It is a joy to spin on.